"Joshua Kryah is redefining what it means to write spiritual poetry. This is not another book about longings for the spiritual; this is a book of offerings to the spiritual. These poems answer the plea of Yeats's spirits ('We are starved') and give them what they crave, depicting the particulars of human appetite and the way each 'peculiar and appalling hunger' unfolds. The scope of these poems is dizzying; they echo and glitter and sear as they, against all odds, give us a'world [that] is/suddener than any idea about the world.' We Are Starved is unabashed and unflinching, and it is deeply, exquisitely satisfying." Joshua Kryah was born and raised in St. Louis, Missouri. He holds an MFA from the Iowa Writers' Workshop and a Ph.D. from the University of Nevada, Las Vegas, where he was a Schaeffer Fellow in poetry. His first collection of poems, "Glean" (2007), won the Nightboat Poetry Prize. He lives with his wife and two children in Las Vegas and teaches at UNLV. He is also the poetry editor of "Witness." "Through the jagged couplets and one-line stanzas of Kryah's second collection of poems runs an unsettling but graceful drama of consumption and consolation... Kryah opens up a space in which the reality of the body can be explored and made significant without sacrificing the metaphysical." "In haunted days more filled with violence than grace, Joshua Kryah has found the sacred, a way to be amazed at how 'you can move among the world's misfortune/and still consider it good.' We Are Starved's breathtakingly mature poems are fueled by a man's internal combustion, the tremendous labor it is to live well 'to be a father, a lover, a son' in a fallible world. 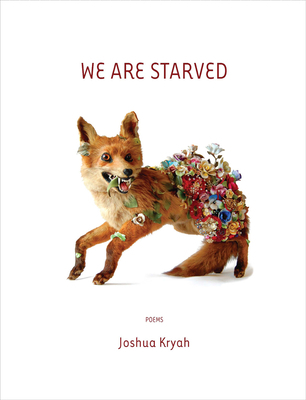 There's a gorgeous, seeking darkness swelling the heart of We Are Starved, one that marks Kryah as among contemporary poetry's finest young voices." “Kryah's lines are full of figurative grace: The images stun and accumulate. We Are Starved introduces an important poetic vision, a surprising and exciting voice."